Lightning McQueen is too old to race in Cars 3. You wouldn’t know that by looking at him. The elderly cars in the Cars-verse range from Model Ts to ‘50s classics. How that works is a mystery. Do cars transform into different models when they hit middle age? 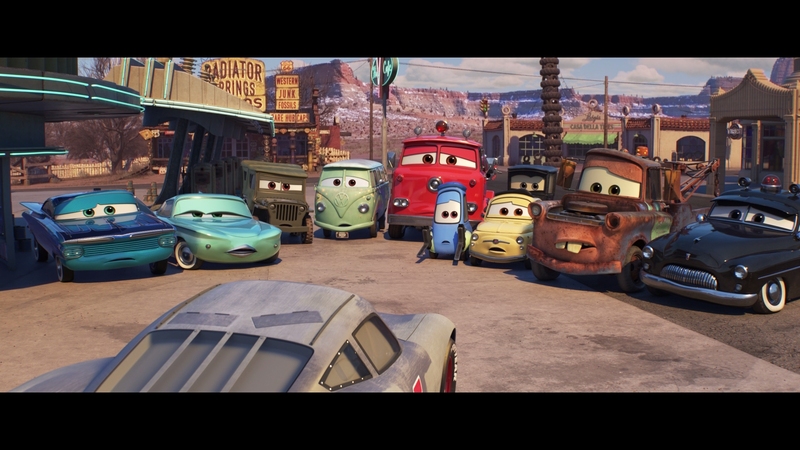 Pixar’s Cars is an anomaly. Internet theories suggest a post-apocalypse. Humans died, cars were born. The machines won, and now fight human-like battles. 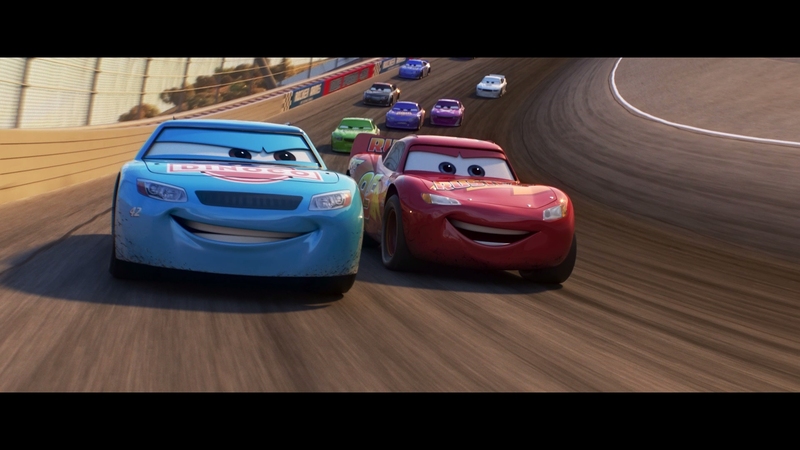 In this case, those battles happen on a race track, and furthermore, McQueen can’t keep up anymore. McQueen’s opposition? The aerodynamic young superstar Jackson Storm (Armie Hammer). He trains on super simulators, has all of the latest tech, and comes branded with new age sponsors. Storm here is Ivan Drago. McQueen tests his skills on vintage beaches and muddy tracks where the bleachers barely hold together their rotting wood frames. 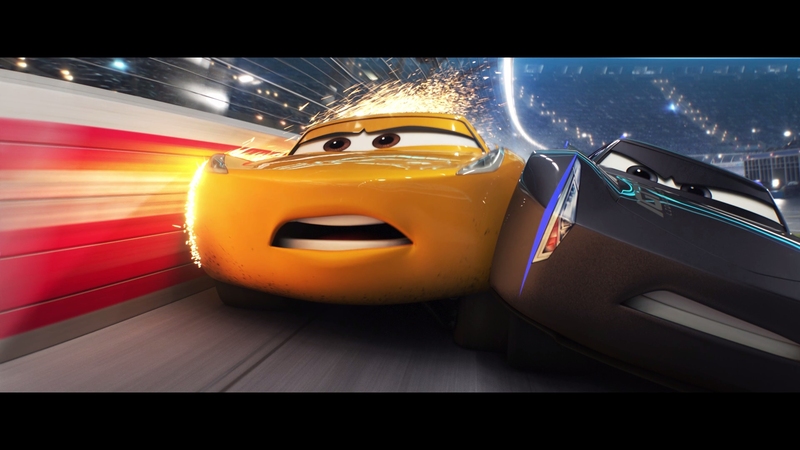 McQueen is Rocky, and Cars 3 is Rocky IV – minus the overpowering and comical nationalism. It’s a suitable children’s tale, whittled down to a story of guts and determination. McQueen’s eyes always have a firm, gritted look as he works. Arrogant Jackson Storm is made out, clearly so, as a false idol archetype. His superficial coolness feels branded; McQueen sticks to what works. Cars 2 never happened, or so it seems. 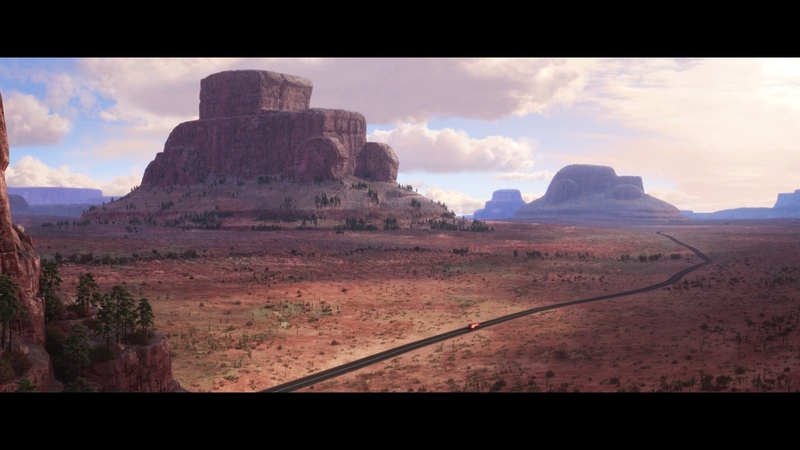 Pixar forgot about that side story blunder too, along with animation fans. Instead, Cars 3 has the freedom to recast the original story, forcing McQueen to pick himself up from disaster, almost as if representing this series as a whole. 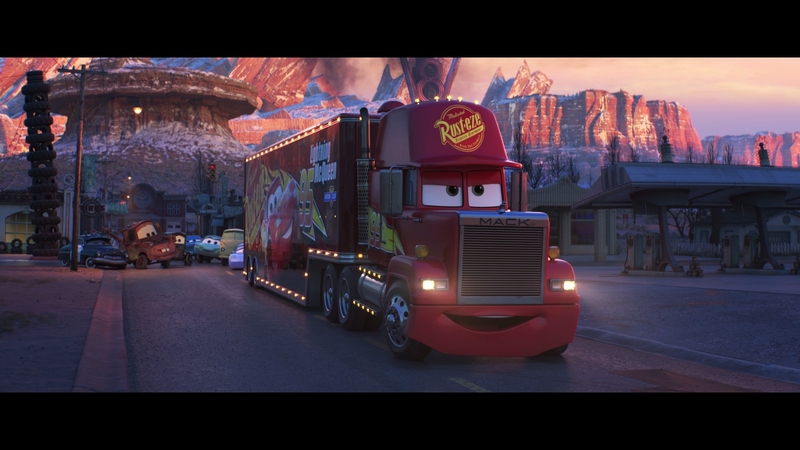 Cars 3 isn’t without routines. It’s the sports genre, the underdog saga, and a tale of hard work’s payoff. That’s inspiring. 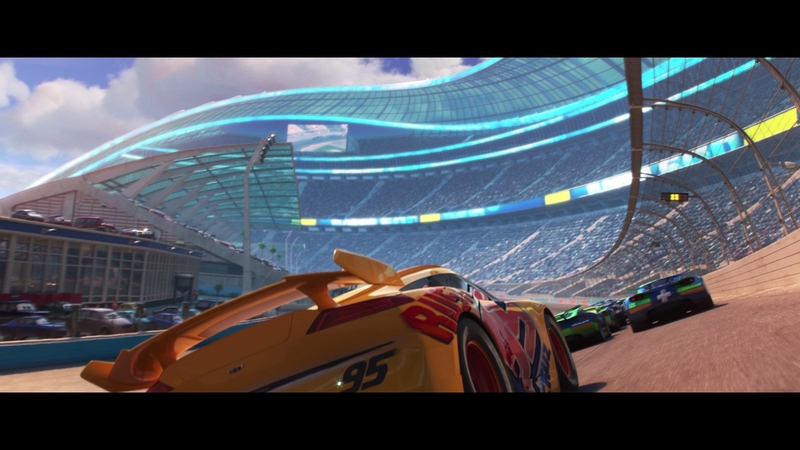 Come the ending, Cars 3 makes its swerve and it’s great. If Cars 3 felt derivative and cliché, the swell of empowerment in the story’s climax is splendid. Pixar takes a chance, upending a billion dollar toy franchise (although assuredly with Disney approval) to plot out a different sequel opportunity. 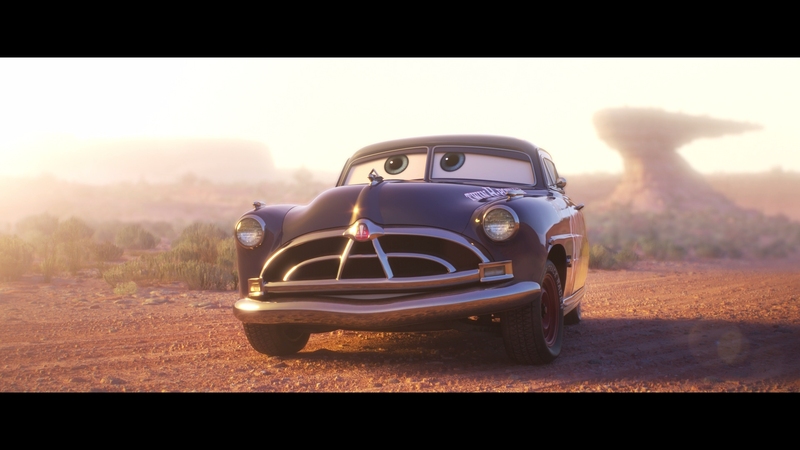 In its closure, Cars 3 isn’t just a redemption story. It’s not here to follow a plain, inspirational narrative. Cars 3 wants kids to understand feelings and how to spot someone in need. Be humble, and feel the excitement of watching others succeed. Accept when others are better. Cars 3 is the best ending for Pixar since Toy Story 3 left Buzz Lightyear and the team with a young girl, passed on to a new generation. Pixar, it turns out, is really good at this. 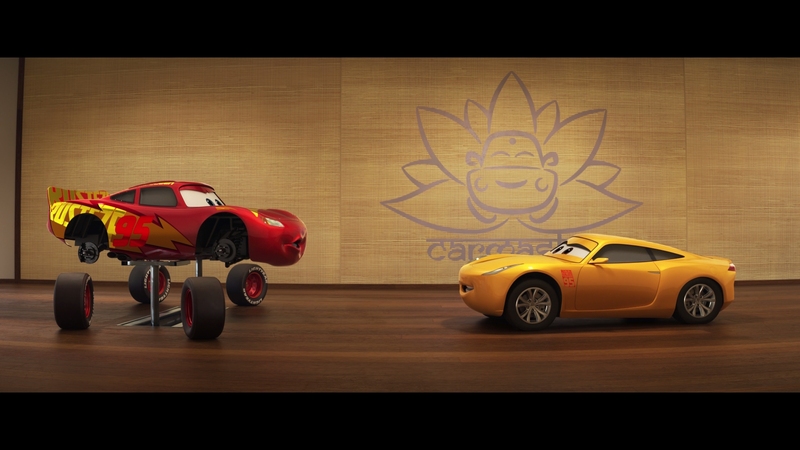 There’s a contrast problem in Cars 3. Focusing specifically on the beach scene to begin, the skyline lacks almost all color. Instead, it’s an overly sunny blob of light peering down on the frame. Color washes out, light bleeding over onto the entire image; the HDR effect runs amok here. No adjustment of the contrast can fix it. Watch the Blu-ray where the pale but blue sky sits overhead during this same scene. Cars 3 looks bleached for most of its runtime. 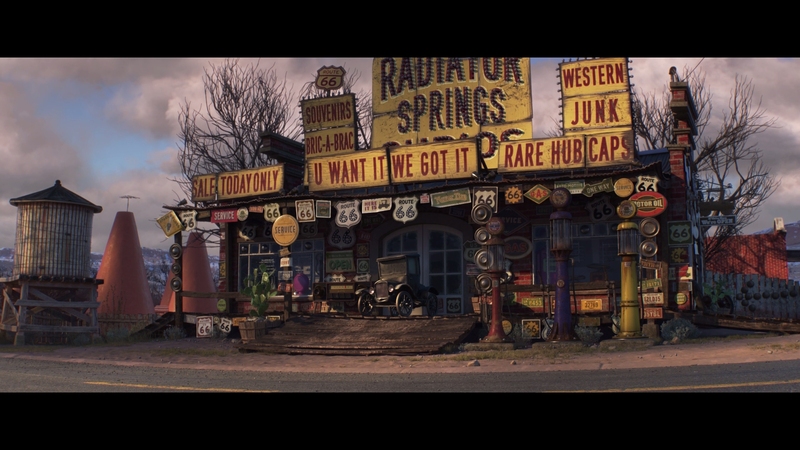 Even daylight in Radiator Springs overpowers the screen with light. The reprieves come during the nighttime figure eight demolition derby and other darker scenarios. Under the contrast sits an otherwise great disc. 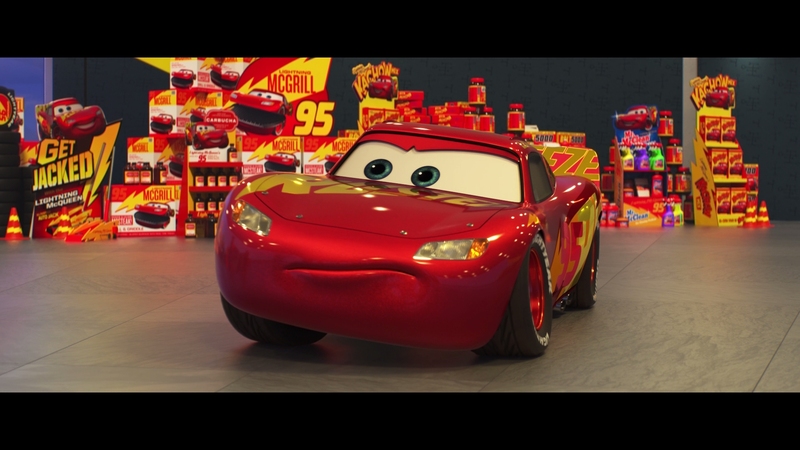 Maybe Cars 3 isn’t high on detail from this 2K source (although it’s possible to pick up the shimmering texture of McQueen’s new coating), but fidelity still rules. Sharpness in exteriors picks up subtle minutiae on the ground or tracks. Explosions swell into beautiful fireballs, with plenty of fidelity to admire. Just a hint of aliasing is visible on car grills. That’s a minor issue. When not baked by light, firm, gorgeous color spreads across the screen. Cruz’s yellow and McQueen’s red make for a grand tandem. Shots of the final track from a distance bring out stunning ocean blues and the same for the stadium. A fireworks display when it’s all over? Flawless. Black levels show merciful restraint, natural and pure. Depth holds firm, adding a strong sense of dimension to the feature. Perfect gradients and shadows show off this format’s potential. Forget the contrast problems of the UHD. 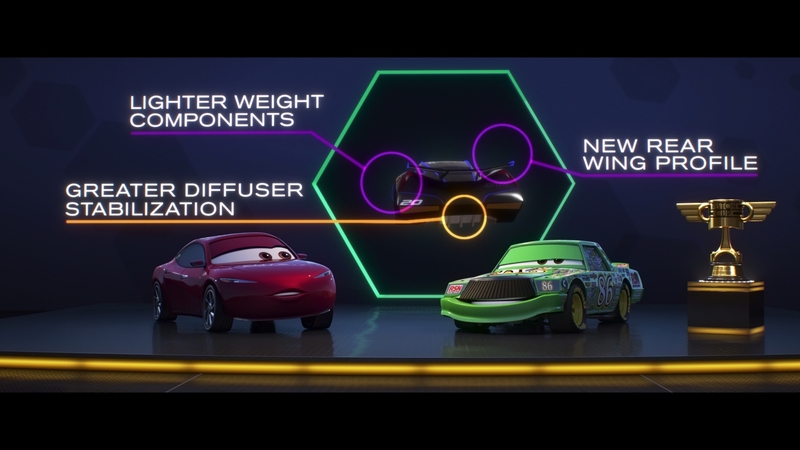 Cars 3 can boast about a sensible contrast, properly calibrated and pure. Blue skies return after their 4K absence. In this way, the Blu-ray for Cars 3 is the preferred disc. In other ways, not as much. Color obviously lacks the density of the 4K counterpart. McQueen lacks the firm reds; he looks more orange at times. Black levels lack heft, but certainly meet Blu-ray’s capability. 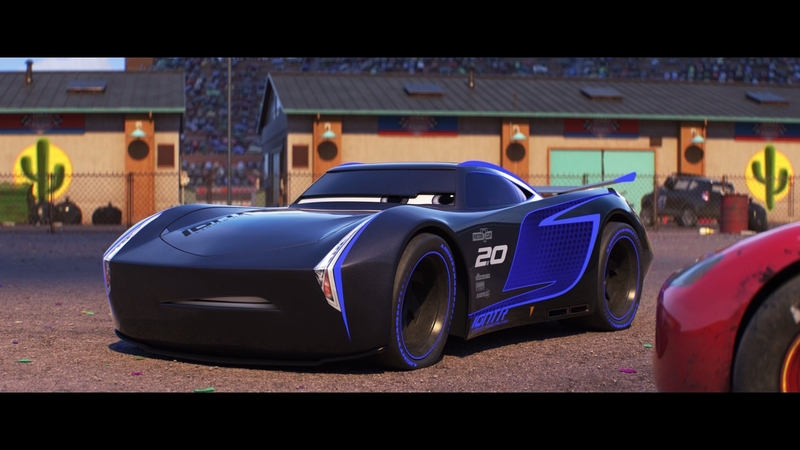 There’s a loss of dazzle that naturally comes without the support of HDR, but Cars 3 holds up. Besides, the drop to 1080p looks marginal. The 2K source material looks superb, granting the feature with stellar fidelity and clarity. 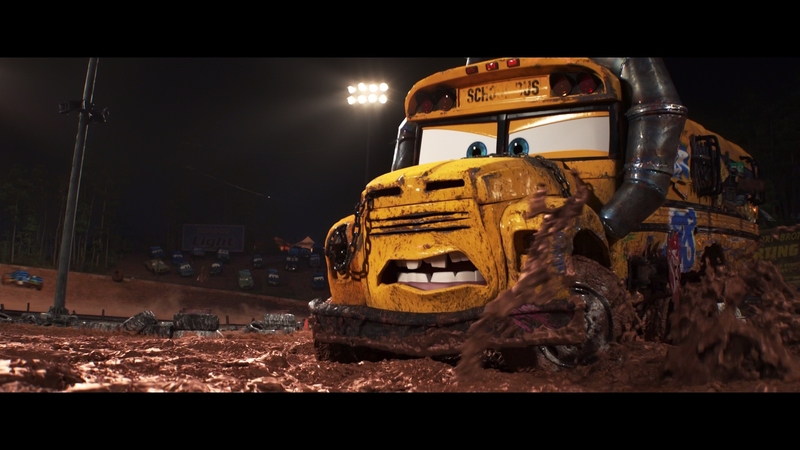 It’s easy to put Cars 3 against any of Pixar’s other works. Note the UHD defaults to a Dolby Digital 5.1 mix. The horror. Make sure to select the Atmos track. The nature of Cars 3 means a bevy of panning effects. Cars regularly sweep through the soundfield, passing by aggressively. It’s a faultless effect. Entering into a cow/tractor stampede, the audible chaos works overtime to place listeners in the center. This is also the only real surround use. Car 3 uses a strangely timid soundfield, mostly concentrated to the fronts. Wide use of the stereos tracks plentiful dialog or other sound effects. Pleasing spread across the fronts adds dimension to the mix, even if the surrounds often fail to register. 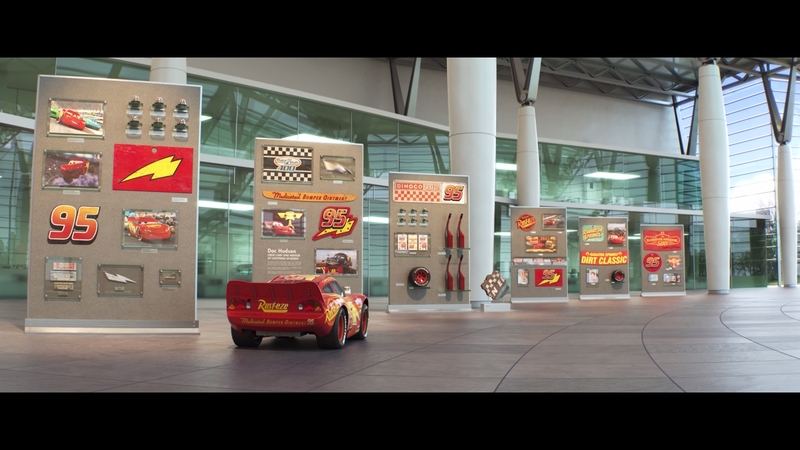 Cars 3 stays active throughout. Dynamic range is a little pinched, restricting bass to a few major blasts. Explosions at the destruction derby offer some weight, and passing engines rev up solidly. The rest sounds a touch flattened. Pixar’s masterful storytelling is evident in Lou, their starring short. It’s better than Cars 3. A commercial for Mrs. Fritter’s Racing Skool runs three minutes. Ready for the Track discusses real world racing with an up-and-coming star. Peeking into Pixar’s design philosophy, The Yellow Car that Could focuses on the ideal look for Cruz. The final bonus on the disc is a commentary. Director Brian Fee, producers Kevin Reher & Andrea Warren, and Creative Director Jay Ward team up for this Blu-ray exclusive. But wait, there’s another bonus disc. Opening with a five-part featurette, totaling around 40-minutes, this looks into the sequel process, specific sequences, and even the toyline. Separate from there, a few fly overs of digital environments is an interesting look at the work. My First Car asks the cast and crew about (what else?) their first cars. Brian Fee introduces a handful of deleted scenes, near a half hour total. Trailers and promos complete Cars 3. 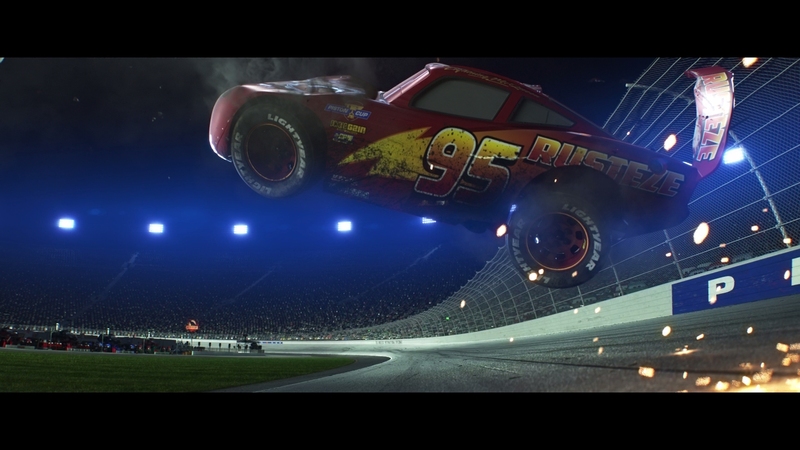 Cars 3 teaches an impressionable audience how to be humble, and does so by recreating the story of Rocky IV – minus the angry Russian. The 15 unaltered images below represent the Blu-ray. For an additional 12 Cars 3 screenshots, early access to all screens (plus the 8,000+ already in our library), exclusive UHD reviews, and more, support us on Patreon.